Hummingbird in Flight pattern is on the website! My recent pattern, Hummingbird in Flight, is now on the website. Each pattern includes the templates already traced onto freezer paper. This is the pattern that we will be working on at the Spring Applique Retreat. I have 2 spots left for the Retreat so if you would like to come, sign up soon! Everyone who comes to the Retreat will receive a pattern and a Fabric Supply List for this block. In my last post I showed pictures of my Hugs and Kisses quilt that I have just started to hand quilt. Some of you asked about how I mark my quilts for quilting. This is the first quilt that I have marked before I sandwiched it with the batting and backing. It is so much easier to do it this way. I decided on cross hatching and my lines are 1″ apart. I contemplated making the lines 1/2″ apart, and then I came to my senses! There are 4″ sashings between the blocks and I was a bit stumped about what to quilt in that area. I thought it might be cool to do a scallop around each block, kind of mirroring the scallops in the border. I made a scallop template 2″ x 4″, so there are 3 in every sashing. So far, so good! I used a Clover water soluble marker (the blue thick one) to mark the lines. I am using YLI 100% glazed cotton quilting thread and I love it. I did a bit of research online and discovered this little gadget that I cannot live without. I was lucky enough to find it a local quilt shop:) I wonder how I ever hand quilted without it. It’s Aunt Becky’s Finger Protector. Once you get the hang of it, it is quite easy to use. And the best part? No more pricked fingers! Last, but not least, for the batting I chose Hobbs 80/20. I am loving the effect! The most challenging part of this journey is trying to quilt while Bruin takes his nap on the quilt. Oh I almost forgot. I am using Clover Black Gold Needles (Quilting size 10) and these needles are gliding right through the batting. I highly recommend them. The Academy of Applique is fast approaching (too fast lol) and I am putting the finishing touches on my class samples. This year I am teaching the Rose of Sharon, and The Blue Jays. Hooray! My “Hugs and Kisses” quilt top is ready to be quilted…by hand! I’m really excited to get going on this next journey. So once the blocks and sashings were all sewn together, I soldiered on and completed all 4 borders (complete with swags and flowers!). The quilt top is now marked and basted together. Now I just have to sit down with a pot of tea and stitch the day away! Of course I am finding time to work on “Twas the Night Before Christmas”. The pieces are small, but doable! Can you guess what this is? I am going through my stash looking for the perfect roof fabric. 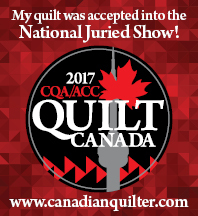 Last month I was invited by the Simcoe County Quilt Guild to come to their meeting and do a demonstration of Prepared Edge Applique. I had so much fun and was made to feel very welcome by everyone. I have only 2 spots left in the Spring Applique Retreat. You can find the details here. Hope you can join us!